South African IP Video Surveillance And VSaaS Market is expected to garner $51.8 million by 2020, registering a CAGR of 16.1% during the forecast period 2014-2020. 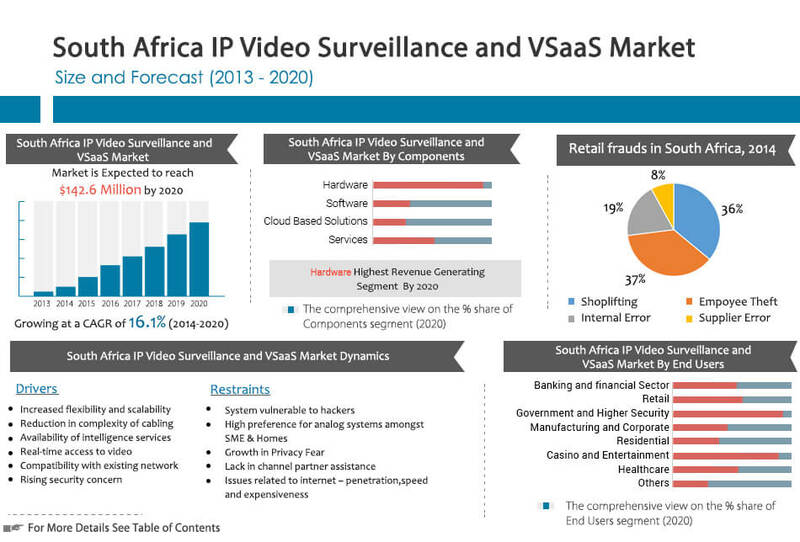 The South Africa IP video surveillance and VSaaS market is at an evolving phase. After the impact of the recession during 2008-2010, the South African video surveillance market was cushioned by the constructions for FIFA World Cup in 2010. The IP video surveillance and VSaaS market gained momentum since then, slowly replacing the analog surveillance systems. The adoption of IP surveillance system has witnessed a surge in recent years. The growing security concerns and shift of consumer demand from traditional surveillance system to network surveillance for better clarity and management/analysis of surveillance data have been catalyzing the market since couple of years. Lack of awareness amongst the customers is restraining the market growth. Probable customers from the commercial and government sectors are aware of the importance of network surveillance system; however, a widespread awareness is yet to reach the home owners. System integrators play an important role in the adoption of IP surveillance in the country as they are the sole point of contact for customers to avail surveillance solution. South Africa IP Video Surveillance and VSaaS market is segmented into component and end user. Hardware component was the largest revenue generating segment in 2013 and cloud solutions accounted for the lowest revenue. Based on components, the market is further segmented into hardware, software, cloud solutions and services. The end user segment has been segregated into banking & financial sector, retail, government & higher security, manufacturing & corporate, residential, casino & entertainment, healthcare and others. Banking and financial sectors was the largest market in 2013; however, manufacturing and corporate are the sector would be the fastest growing market during the forecast period. The key players operating in the South African IP video surveillance and VSaaS market include Avigilon Corporation, Axis communication AB, D-Link Corporation, Genetec, March Networks, Milestone Systems, Panasonic Corporation, Mobotix AG, Geovision Inc. and Arecont Vision. The market is segmented on the basis of component and end - user. 6.9.4 SWOT analysis of Geovision Inc. FIG. 27 SWOT ANALYSIS OF GEOVISION INC. The IP surveillance and VSaaS market is in its developing phase in the South African region. Increasing penetration of broadband internet and growing demand for high-tech security and surveillance systems, are creating the need for network surveillance system across this region. 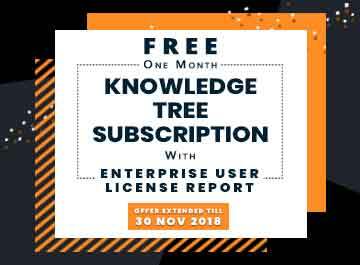 As IP surveillance is in a developing phase in most of the countries, the hardware and software providing companies are launching new products with enhanced functionalities and features. Hardware devices such as IP camera, LCD monitors and various storage devices are in demand in this region. Cloud-based solutions are less-preferred solutions for IP surveillance in South Africa, primarily due to lower technological adoption compared to the developed countries. Nevertheless, the prevailing trends and technological advancements in the region is paving the way for the adoption of cloud-based security services in the country. The growing awareness for cloud services is favoring the growth of cloud-based IP surveillance. South Africa is the most advanced country in Africa, considering the adoption of new technologies. The IP surveillance systems are adopted by numerous industry verticals due to its accessibility through web-based applications. Advantages of IP surveillance systems viz., improved flexibility and scalability over conventional surveillance systems, reduction in the complexity of cabling, real-time accessibility to the video, compatibility with numerous network devices are supplementing the adoption of IP surveillance systems across diverse industry verticals. The need of high security in the bank and on- and off-site ATM areas, is driving the adoption of IP surveillance systems in the banking and financial sector. In order to reduce the shoplifting cases and monitor the resources in the shops, retail sector is also majorly adopting these systems. Further, a continuous rise in the trend for the adoption of IP surveillance systems is observed across other sectors as well, which include government, manufacturing industries, commercial and residential areas and healthcare sector. "South Africa IP Video Surveillance and VSaaS Market"